It's summer again, and the weather was in keeping, with temperatures of up to 30°. Spent some time finishing off my Daemon's Advocate article, after which I decided not to do any more computer-related work for the day. After cleaning out the water filter yet again, off shopping with Yvonne, and bought a garden swing, which she has wanted for some time, and also a ladder. Assembled the swing and found it was just the right weather for it today: normally it's pretty windy round here, but today was really pleasant. More work on the book today, nothing much to report. I'm gradually getting there: only five chapters to complete. Spent some time working on the “desktop” theme. The more I look at “desktops”, the more I think they're a bad idea. Finally got Gnome working, sort of. The documentation is missing an entire section on pre-startup configuration, and for some reason I ended up with an fvwm2 window manager, possibly because it found the configuration files, but the configuration screens claimed it was using twm. I'm looking for something to point beginners at, so maybe I'll go back to KDE. Still more work on the book, also trying to build KDE. I'm doing all this on sydney.lemis.com, a laptop connected by wireless (802.11b). It's becoming increasingly clear how slow 802.11b networks are. Some of these product builds take over 12 hours, like the Galeon port I installed overnight. Received disconnect from 192.109.197.80: 2: Corrupted MAC on input. I have no idea what that means, but I suppose I'm going to have to find out. In any case, I can't see why it should drop the connection, let alone why rsync should then discard the partial copy. Grrr. Got round that by making a second link to the temporary file, which proves to work, but which shouldn't be necessary. Spent more time downloading Knoppix, which proved to be more work than I had expected. It certainly shows the advantages of split(1). Ended up taking echunga down and changing for a 3Com card, which seems to work alright—so far. Once I got the ISO burnt, I was quite impressed with Knoppix. It's a CD-ROM based Linux operating system which doesn't need any disk. I booted it on sydney, my Dell laptop, and it started KDE 3 on it with no trouble, and even started my wireless network card, which traditionally has been a bit of a problem with Linux. It also started OK on monorchid, but that machine has an old VGA-only monitor, and it tried 800x600, which couldn't work. It allowed switching back to 640x480, though. Total eclipse of the sun today in Ceduna. We had thought of going, but the thought of being in a town of 2000 inhabitants with 30,000 others didn't excite us, and the possibility of cloud cover at that time in the evening seemed high. Certainly the weather in Adelaide seemed unpromising: windy and cloudy. I had hoped for a view of a partial eclipse from the Hack Ranges up behind our house, but there was no hope with the cloud cover we had. Filthy weather today, cold, rainy and windy. Liz Carroll called me from Sydney and said the weather was different there: hot (37°), windy and smoky. The smoke was from the bushfires which are burning in the north-west and the south of Sydney. They could certainly have some of our rain: our water tank was full to overflowing, something that's never happened in December before. More work on the book, and things are gradually showing signs of completion. That's a relief. More work on the book, and finally got KDE 3 up and running. I've got to describe a desktop in the book, but I'm gradually coming to the idea that desktops are bad ideas. I don't know how to explain things in a polite manner. Also reinstalled X on monorchid from a port. Not a good idea on top of an existing installation: the server was non-functional. Reinstalled from scratch, blowing away libraries needed for Emacs. sigh. Yvonne went to town today and got me a new power supply for the AUUG web server. Finally we have the machine up and running, only took about 3 months. Today was the AUUG SA Chapter's Installfest, and I was signed up as one of the helpers, so off early to Adelaide. Things went relatively well: they wanted me to present a paper at 10:30, but since the event only started at 10:00, nobody was there yet. That went relatively well, and I spent some time helping people install FreeBSD. There seem to be more and more of them all the time. I walked round looking, and I'd guess that nearly half the machines I saw were running FreeBSD. This puts the Ctrl key next to the A key, the Alt key bottom left, and gets rid of the CapsLock key, as God intended. The only other thing to do was to have enough virtual terminals to run three servers. In /etc/ttys I disabled all vts after /dev/ttyv6. After that I could change from one display to the other with Ctrl-Alt-F8, Ctrl-Alt-F9 and Ctrl-Alt-F10. Got back home and discovered I had left my laptop power supply behind. Grrr. I do that all the time. Fortunately, Luke Schapel had found it and taken it with him, but it's another journey into town. Slow day today. Slept long and was still tired. When I got up, spent some time thinking about writing a chapter about diskless operation of FreeBSD. Yesterday a couple of people had told me that they were interested in the topic, so I sent a message to FreeBSD-questions asking if there was any interest. There was. I got a couple of replies within minutes, and many more in the course of the day. In the meantime, did some scavenging of old hardware, an iWill motherboard with an AMD K6/233 on it. Those things ran very hot, and the CPU fan was appropriately dimensioned, but my fan had died. Discovered that a Celeron fan also fits, though they have changed the connectors in the five years since I bought the motherboard. Got it running, still without a disk (that will come out of the old AUUG web server machine: I've put a 13 GB drive of mine in the new machine in return for the disks from the old machine (1 GB, 10 GB)). In the meantime, of course, it's the ideal machine for testing diskless boots, especially I have a 3Com board which is so keen to run PXE that it even offers to do so when I tell it to disable network booting. Spent some time with that, also investigating how to stop air-gw offering DHCP leases on the wired network, which is echunga's property. In the afternoon down into the valley to pick up my power supply from Luke Schapel. Had a look round his shed in the process: he has an old Z-80 machine with 8" floppies which may still be functional. I have a number of 8" floppies with data on them that I'd like to see again, so we're planning to revive it. Another day with not too much to show for itself. Did a bit of work on the diskless booting chapter for the book. It's always difficult to start a chapter from scratch, and it occurs to me how seldom I have done it lately. More work on diskless booting today. It's a little difficult to get your head around, so obviously a good topic for the book. I've done diskless booting before: the Sun 3/60s that I played with in November 2000 booted that way too. Things are different on a PC, of course: firstly, the BIOS doesn't know about net booting, and there are several different ways to do it. I have some 3Com 3C905C boards which support PXE. I tried a normal boot of the kernel, but that didn't work because the image was too large. It seems that the cards work in 8086 “real” mode with only 640 kB of memory available. PXE worked, though, after a bit of playing around, and I was able to build world almost as fast as if the machine had had a local disk. There's still some funniness with the startup, though. It's quite possible that I'm going to have to fix the startup scripts for 5.0. It's a funny feeling having the machine running without a disk. It's only a K6/233, but that's obviously vastly different from a Sun 3/60, and it didn't feel any slower than a system with a disk. While building worlds, ran into some problems cloning source trees. The kernel build directory has a subdirectory modules which contains symlinks pointing back up the directory hierarchy, which causes mklinks to loop creating ever deeper directories. Spent some time looking at that, but didn't have much success. More work on the diskless chapter today. Got the PXE boot stuff worked out pretty well, and started playing with Etherboot. Interestingly you can use the same boot images either on PROM or on floppy, accompanied by a small bootstrap in the latter case. To my surprise, the boot worked immediately, but I wasn't able to get the kernel up and running. I wonder if it's because of the size: the FreeBSD 5.0 kernel is now over 5 MB. When I first started with BSD, it was under a megabyte. It reads in the kernel, filling the screen with dots, then prints Done and one more dot. And that's it. Learnt on the way that the boot uses NFS, not TFTP, which might have something to do with the problem. Also more building on zaphod. I haven't been able to build a complete kernel yet without it hanging on me. I've been building over NFS, which I suspect could be relevant to the problem. Tried building on local disk, which was still going by evening. On monorchid playing round with Vinum, and found another couple of bugs. sigh. I really need to look at this stuff more carefully. Power failure at 5:45 am today. In the process, it turned out that three of my test machines were not on UPS, including gatefree, which had been up for 147 days. Grrr. The real problem is that the output connectors of these UPS are not normal power plugs, so I can't plug just anything into them. It seems almost impossible to find the correct connectors, too. Got a call from the CD burning house. Our Knoppix CD seems to be more of a problem than I thought. It seems that my CD-R burner can't handle 700 MB (80 minute) media. Burnt two more CD-Rs, which both claimed to have written the full 700 MB, but on reading back they both failed in exactly the same place, after about 660 MB. Looks like I need a new CD-R burner. Work on Vinum took precedence today. There's still some strangeness with newfs, and also found that the conversion to devfs had reintroduced the old, volume-based subdisks and plexes, causing a number of ENOTTY errors. I'm surprised it took such a long time to find that. Also a brucifiction about a commit I did yesterday: the format strings I used don't work for 64 bit platforms, and those which would work for 64 bit won't work for 32 bit. What a mess. Also a bit more work on the book. The real issue I have here is that things just aren't correct in the system. I can document them, of course, and after the release I can fix them, but then the book will be inaccurate. Or I can document how I intend to fix them and then discover that somebody has an objection to it. What a quandary. Up late today, and didn't get started very quickly. Somehow I'm running out of steam with the diskless boot chapter, but spent a lot of time looking at it anyway, including various kinds of booting with etherboot. All of them failed, and I'm still no closer to understanding why. In the afternoon did some reading through the FreeBSD handbook, and came to the conclusion that I needed more stuff on security. Started importing the text from the handbook (yes, it's legal :-), and noted how difficult document format conversions are. I'd use DocBook if I could find more convincing examples of its utility. In the evening did some cooking. It's surprising how few recipes I can find for Biriani, and how much the individual recipes I have vary. I can discount the Malay versions, I think; it's not really a Malay dish, and the Malay Beryani (sic) tastes very different. Finally made a recipe from Charmaine Solomon's “Complete Asian Cookbook”. Some of these recipes leave me with the impression that they have never been accurately quantified. Anyway, diverged a bit, with good reason as it turned out. Here's my version. Spent more time working on the security chapter today. It's really difficult to import text from other documents. I've done it before, but in every case I forget just how much work it is to take relatively well-written text and re-express it in a way with which I feel comfortable. Interestingly, it also means that the text shrinks by about 25%. Also more work on the diskless booting, and finally got the machine to boot. As so often, there were two problems ganging up on me to make it more difficult: I had specified an invalid root path in the dhcpd.conf file, and when booting with Etherboot, for some reason no messages appear on the screen until the login: prompt. I must investigate the latter; it doesn't make sense, and it makes it more than a little difficult to boot into single user mode. After that, decided to completely reshuffle the book organization. That will probably take a bit of shaking out, but it really doesn't make sense to talk about global system configuration before talking about networking. Another power failure in the middle of the night. At least I had fixed up the UPS connections, and this time my machines didn't fail. Later, Yvonne called me on the phone from the dam to say that the bore pump wasn't working. Up to take a look, of course without any tools, and was able to confirm that yes, the pump wouldn't start. Back down again and did some work, then up again with some tools, which confirmed that there was no power to the pump; at least it wasn't an expensive failure, and I guessed it was related to this morning's power failure. Called ETSA and got a clerk who wanted to know the pole number for the transformer, which is in Rodert Road. When I couldn't give him the pole number, he wanted our address (Battunga Road), and wanted to send somebody there to look for the pole. Sheesh. If these pole numbers are so important for localizing problems, why don't they print them on the bills? Later the ETSA people came along and did a reasonable job of testing, including the connections from the transformer, which is a good 200 metres from the pump shed, and the fuses on the pole. Finally, we checked an unmarked switch and it worked. Somebody had turned off the main switch. Fortunately, they weren't too upset about it. More work on the book, now going through to check whether the sequence of chapters is better. It seems to be. Summer is here! A week ago, the top temperatures of the day were round 16°, and now they're in the mid-30s. More work on the book, and gradually it's beginning to look a bit more complete. The reorganization of the chapters was definitely the right thing to do. Got further through the security chapter, which also needed reorganization. I'm also learning new stuff, which gives me some ideas about things to do. Yana is doing some reorganization of her machine, firefly. It hasn't really been upgraded in years, and portupgrade failed miserably. Why is it that /var/db/packages/ so often has information missing? Gave up, yet again, and started a more-or-less from scratch ports installation. On a Pentium 266 and over 802.11b, that'll take a while. Continued yesterday's work today. It took 8 hours to rebuild X on firefly, which surprised me somewhat. Also more work on the security chapter, and decided to try out the Kerberos instructions. What a disaster! They're completely out of date, and I don't really know enough about the topic to do it justice. It looks like the security chapter won't make it into this edition of the book. Moved on to the firewall chapter, which required refreshingly little change. We can now kldload the firewall module, which I tried on zaphod, with the result that I immediately lost connection. Then spent a bit of time trying to set up NAT, which I think I have never done before. It's convenient to have a bit of spare network hardware lying around. Somehow couldn't get back into the swing of things this morning, and looked instead at all the hardware stuff I really should have done. It's been over a year since I had one display wrapped around from the extreme left to the extreme right. In those days, it was monorchid wrapped and wantadilla in the middle; now it was wantadilla wrapped, echunga in the middle, and monorchid has gone back to being a test machine. The result seemed to be that I was opening most echunga windows on wantadilla and vice-versa. In addition, I really wanted to get the mouse configuration changed. echunga has a parallel port laser printer on it, and it can hit more than 100,000 interrupts a second, which slows the mouse down to a crawl. Since wantadilla is the main machine, it made more sense to connect the mouse there. While I was at it, also decided to change the disk on flame, the OpenBSD Sparc 5 which died a couple of months ago. Changing the machines around was easy. wantadilla is now to the left of the left-most monitor and serves the two left monitors, and echunga serves the right three. That leaves space for a third machine (flame? sydney?) on the extreme left. Configuring wasn't bad either, but I couldn't get the mouse to work correctly. It looks as if there's a bug in moused: since I can't get the thumb button to work on this Logitech cordless mouse, I want to use either the wheel (either direction) or buttons 1 and 3 to emulate button 2. Button 2 works, but it's very difficult to use without pressing the roller. The roller's fine some of the time, but you can't drag with it, and somehow I couldn't get the mouse daemon to give me both. Gave up, somewhat frustrated, and connected the mouse back to echunga. flame wasn't such a problem. Seems the disk isn't dead after all, but it makes quite a bit of noise. The only other disks I have with the 80 pin interface were ST15230WCs, and they're full height. That in itself wouldn't be a problem, since the machine has bays for both, but the second connector gets in the way of the disk and makes it impossible to connect. Spent some time pondering that one. Also a bit of work on NAT. I don't think I've ever done this before, and I didn't get finished. More work on rebuilding machines today. Did a bit of playing around with flame, in the process discovering that my old Sun CD-ROM drive (single speed!) didn't have a dead power supply after all; only the caddy was jammed, and I was able to extract it and insert another. That left me with a spare 50 pin connector for a conventional SCSI disk, so was able to install on that, relearning stuff about Open Firmware in the process. Also continued upgrading Yana's machine. Upgrading is really becoming a serious issue, and I didn't finish. Yana complained that mutt was setting her mail folder read-only, something that I've seen as well. To make things complete, decided to finally install FreeBSD on a disk on the machine that I have so far called bumble or fumble and used for the diskless booting exercise. I'll end up giving it to a neighbour for Christmas, so installed stuff like OpenOffice that I'd normally not use. The installation didn't go well: it wants Java, and as I've noticed already, the licensing nonsense make it a pain to install. Also did a little work on NAT. It didn't work, and I couldn't work out why. flame:0.0 running at 1152x900x8. I can't find out what the card is, but I was pretty sure that it is a 24 bit card, so once I work out how to configure the SPARC X server, I'll change that. A Matrox G200 on wantadilla:0.0, running at 1920x1440x24. Horizontal sync is 105 kHz, vertical refresh 71 Hz. The monitor is a Hitachi SuperScan 813. A Matrox Millennium on wantadilla:0.1, running at 1600x1200x16. The two Millennium cards are not the same, and that this one had a maximum dot clock of 220 MHz, not 175 MHz like the other one, so I could run this one at 106 kHz horizontal and 85 Hz vertical. Unfortunately, the monitor is an iiyama VisionMaster 21. 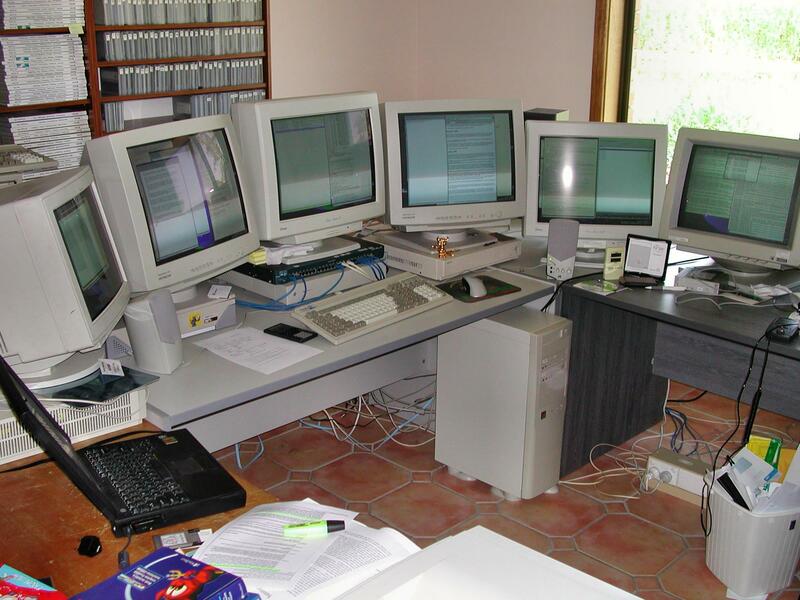 I used to quite like this monitor, but it's getting old now, and the Hitachi and IBM monitors both leave it behind. It has a maximum horizontal frequency of 94 kHz, so I run it at 93.6 kHz horizontal and 75 Hz vertical. A Matrox G400 on echunga:0.0, running at 2048x1536x24. Horizontal sync is 114 kHz, vertical refresh 72 Hz. The monitor is another Hitachi 813. Another Matrox Millennium on echunga:0.1, running at 1600x1200x8. Due to the slow dot clock (175 MHz), the horizontal sync is 84 kHz, and the frame refresh is only 67 Hz. The monitor is an iiyama VisionMaster Pro21. This is not quite the same monitor as the other iiyama; it has a Trinitron tube with vastly inferior contrast and resolution. It's barely usable. An old ATI Mach64 on echunga:0.2 running at 1280x1024x8. Even so, the vertical refresh is only 74 Hz, and the horizontal frequency is 79.5 Hz. The monitor is an iiyama VisionMaster Pro 21, with a trinitron tube which is much worse in resolution, contrast and convergence than the conventional tube in the other iiyama. That's why it's on the low-resolution display. As before, they are joined together with x2x. I have now passed the 12 megapixel mark with 12098048 pixels. Here are the X configurations for wantadilla and echunga. Apart from that, also worked on firefly, and got most of that stuff working. Setting up XFree86 version 4 on a laptop (in this case, a Dell Latitude CPi) is still a black art. I hope they come out with some better tools. Even with the help of the old (3.3.6) config file, it took me an hour to get it working again. Here's the result. Finally, on the “present” machine, carried on installing OpenOffice, which kept going into the evening. Turned back to the NAT chapter, and compared what other people had written about it. Finally got things working properly, not helped by the fact that the other books which describe it at all both contain serious errors which would stop things from working. I wonder how many other writers really test what they're writing about. The OpenOffice build which started last night was still going when I came in this morning. It carried on all day long and was still going when I left the office in the evening. This is an AMD K6/233, not the most powerful processor on Earth, but I'm still surprised it takes so long. It's getting a bit unwieldy now: 7 screens with 13568048 pixels, the equivalent of 17 1024x768 displays, or 44 640x480 displays. Just finding the mouse cursor can prove to be a bit of a problem. There's a forged fbi.gov there. So I sent the message to abuse@fbi.gov. No such address. That reminds me that army.mil didn't have an abuse@ address either when I got spam from them in September. I never cease to be amazed how badly these people handle their networks. More work on the book. Finished the section on firewalls, even adding a description of squid, and moved on to the network debugging chapter, which could do with expansion. Yvonne visited Christiane Yeardley yesterday, and as usual she came back with a lot of digital photos. I'm getting fed up with having to process them manually, so spent some time writing a Makefile rule which would take a series of JPEGs and make a web page out of them. That was in fact a lot easier than I thought. Also wrote a description of how to use it. That took most of the day, of course, including coaching Yvonne how to use it, but hopefully it'll make things easier. Tried it out on some photos of Cats and horses that I took in November 2001 and never found enough energy to convert to a web page. More work on network debugging apart from that. zaphod joined in the fun and crashed. When it came up, the network wouldn't. Somehow the MAC address of one of the network cards had been set to 00:00:00:00:00:00. Spent a bit of time investigating that, and how to reset the address. Finally got it to work again, but it really seems that the card has had its MAC address wiped out. There must be some way to reset it. The build of OpenOffice office was still going strong in the evening. Barring a build of NetBSD on a diskless Sun 3/60, that must be one of the longest-running builds I've ever done. There was nothing to suggest that it was misbehaving. That's a total of nearly 70 hours to build, and that wasn't from the beginning: it had stopped in the middle to give me the chance to download Java manually. That must be some kind of record. Then moved on to get X up and running on the old ISA boards I had. That wasn't easy. XFree86 version 4 didn't recognize either of the boards, a Diamond SpeedStar Pro, ET4000 based, and an ATI ProDesigner Plus, Mach32 based. Both are supposedly supported. Tried to install 3.3.6, but I couldn't find any precompiled binaries. Finally started a build and left it to it. After that into town with Yana to Adelaide University for another information day. This time we learnt some new details: the entry requirement cutoff wasn't as cast in concrete as we had been led to believe, a concern since Yana's results were only fractionally above the stated level. The other detail was better, though: because she had studied languages, and because she went to the Eastern Fleurieu school, she received a number of bonus points which bumped up her TER by about 15, well out of harm's way. More work on the gift machine today, more out of curiosity than anything else. Managed to get XFree86 3.3.6 to print out the clocks of the ATI card, after which XFree86 4.2.0 was able to recognize it. But then it decided that the clocks were wrong and rearranged them, with the result that only nonsense appeared on the screen. It's time to give up on this stuff. Later in the morning, Jarrod Sayers came in with a few CDs: OpenBSD repo, NetBSD 1.6 and FreeBSD 5.0 RC1, the last of which I intend to use to revise the installation procedures. Installed it with no problems, but I'm still wondering how useful this new graphical X setup program is. It looks as if it doesn't handle things too well. Didn't do much in the afternoon. The relatives are coming for Christmas lunch tomorrow, so spent a bit of time preparing. Christmas Day today, and up early to prepare for the relatives arriving. Discovered that monorchid had chosen today to panic continuously with a memory allocation error. Spent the best part of an hour trying to nurture it back to health, and finally gave up. Since I hadn't changed anything on the machine for a few days, decided it could be hardware, so installed NetBSD 1.6 on a different disk and the same machine. I must write a script to transfer the bits and pieces that I need for getting a new machine up and running the way I like it. Today had trouble installing Emacs because I didn't have the pkgsrc collection, and Emacs needs various X libraries which don't appear to be standard. Moved over to the turkey, a 5.7 kg monster. Checked all the books and decided that the correct cooking time would be about 3½ hours, so started at 10 am. Despite the agreement of most books that this would be the correct time, and my adoption of the suggestion in “Joy of Cooking” to cover it with an oil-soaked cloth, it was finished considerably earlier, in about 2¼ hours. To make up for that, of course, the relatives were late. Apart from that minor issue, all went well, and we had a pleasant time, taking a number of photos. Ran out of steam after they left. Walked round the property for the first time in years—took about 40 minutes. More work on NetBSD this morning, rather frustrating. They've just reorganized the CVS repository, definitely an improvement, but it meant redoing my cvsup files. Finally updated the repository and checked out a new source tree, just to be on the safe side. The build died early, tripping over some unexpected directories. I've seen this in FreeBSD as well, and I'm not certain where it came from. Since I had used FreeBSD cvs to check out the tree, blew it away and checked out with NetBSD, but didn't get any further today. Daniel Demuth showed up in the afternoon, and did a bit of talking before I went back to work. More or less finished reorganizing the network debugging chapter, which is a load off my mind. Later Christiane Yeardley arrived with her friend Fiona Mitchell and Lady, Yvonne's new horse. We've finally given up trying to be able to float Scarlett, so Chris is taking her back to Victoria with her, assuming we can get her on the float tomorrow. Chris and Fiona left with Scarlett in mid-morning after not having too much difficulty persuading her to get into the float. But then, they weren't trying to make her float better, just this time. The build method I used didn't install, anyway, so I had to do that with the last line. I suspect that a simple make build would have worked at this stage, but I was in no mood to try it. Unfortunately, I wasn't able to connect to it from another machine (that's probably what the +accessx means, but I can't find it in the documentation), so started installing xv on zaphod to grab it locally, until I realized that I was still building gnome on battunga with the same sources (NFS mounted on echunga), so deferred that. In the evening, discovered that Pebbles, our oldest horse, had apparently had a few goodbye kicks from Scarlett, and was in severe pain. Thoughts of what happened two years ago came to my mind, and we called the vet—by chance, Digby again, whom I haven't seen since Miss Teak was put down. It doesn't look like it'll be necessary this time, but he wasn't able to find an exact problem. More for tomorrow. Started off in the morning getting images for the chapter on desktop setup. As expected, getting the images was relatively trivial. Now I just need to decide what to say. I still don't like xf86cfg much. Third Hacker's Barbecue today, which took up most of the afternoon. Somehow didn't get much done again today. After all the excitement of the last few days, took it easy, though I did do some more work on the book. Gradually the desktop chapter is taking shape. I'll be glad when this book is finished. A bit of talk about electricity on IRC this afternoon. Seems that American fuse boxes are quite different from Australian ones, so took some photos of our fuse boxes, and in particular of the RCDs (residual current devices), which elicited a certain interest. Another person has found a similarity between me and Osama bin Laden. I've decided to start photo collection. On with the book. I'm learning a lot more about changes in X configuration than I really wanted to. I've come to the conclusion that xf86cfg in its current form is broken. It can't handle existing config files, it doesn't handle additional mode lines, and in the evening I discovered it doesn't work at all if more than one video card is in the system: Bernd Wulf came along with an old PCI display card for Di's computer, and we tried it out in monorchid next to an AGP card. xf86cfg just died; X -configure found both cards and configured them plausibly. Apart from that, made reasonable progress on the desktop chapter. It's amazing how much of the chapter no longer applies. Mail message from Andy Oram this morning with details of how they want the book to look. Since this is O'Reilly's Community Press line, they want a different look and feel. Spent some time looking at that, and came a whole lot closer. I wish I could find a way to get screen output on paper without wrapping and without tiny fonts. More work on the desktop chapter, with the interesting result that it disappeared completely. There were really three only marginally related things in the chapter: choice of hardware, how to install, and how to use. That doesn't make sense in the overall structure of the book, so I've moved them each to a different chapter. I think the next thing that will happen is that I'll split the "getting to know FreeBSD" into two chapters. Finally finished Di's machine. It's barely usable: 640x480 is just completely obsolete now, but the display hardware can't do any more. Certainly squeezing KDE onto it doesn't improve matters. The more I look at it, the more I think that desktop managers are the wrong way to go: they lock people in to a particular program. KDE gives you a different xterm, a different MUA and a different web browser. Sure, you can use others, but most people won't.